Air compressors play key roles at many job sites. They power air tools in auto body and mechanic’s shops, as well as in an increasingly large number of home garages. Certain industrial processes in manufacturing plants also use high-volume compressed air systems. Gregory Poole Compressed Air Systems offers a wide variety of equipment to help assemble a compressed air system to suit your specific needs. Serving all of North Carolina, we work with leading manufacturers like Kobelco, Sullivan, Boge, ALMiG, Van Air, BelAire, Sullair, Atlas Copco and others. As the name implies, rotary screw compressors feature a pair of moving screws that force air into a compression chamber. They are different than reciprocating— piston type —units, which in most configurations, produce less compression and a smaller volume of air. For this reason, rotary screw compressors are ideal for heavy-duty and industrial applications, whereas reciprocating units are better for home or light industrial use. 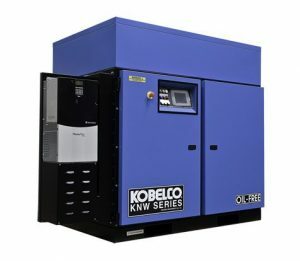 Gregory Poole carries Kobelco, Boge, Sullivan and ALMiG industrial electric air compressors in sizes ranging from 3-700 HP and 43-3000 CFM and 100-190 PSI, oil-flooded and oil-free. Let us match you with a reliable machine that meets your needs and budget. Piston compressors are ideal for applications that require lower pressure levels and output volumes. However, recent improvements in technology have led to new models that offer similar capabilities to rotary screw models, while still delivering the rock-solid reliability that reciprocating designs have. We carry both single- and multi-stage compressors from ALMiG and BelAire. Contact a Gregory Poole representative for more information about our current inventory. 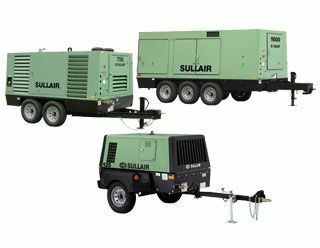 You’ll find portable diesel air compressors in remote construction job sites and other applications that need a reliable source of compressed air power. Gregory Poole carries oil-free and oil-flooded air compressors that range from low pressure 70 CFM to high pressure 2200 CFM from Sullair and Atlas Copco. While most compressors are lubricated to reduce wear on moving components, oil-free models are available for use in sensitive environments where reducing the potential for contamination is essential. Find the right accessories for any job at Gregory Poole. We carry air receivers, after-coolers, dryers, humidity control equipment, filtration systems and more. For help putting together a complete package including a stationary or portable compressor along with a full set of accessories and tools, contact a location near you today.